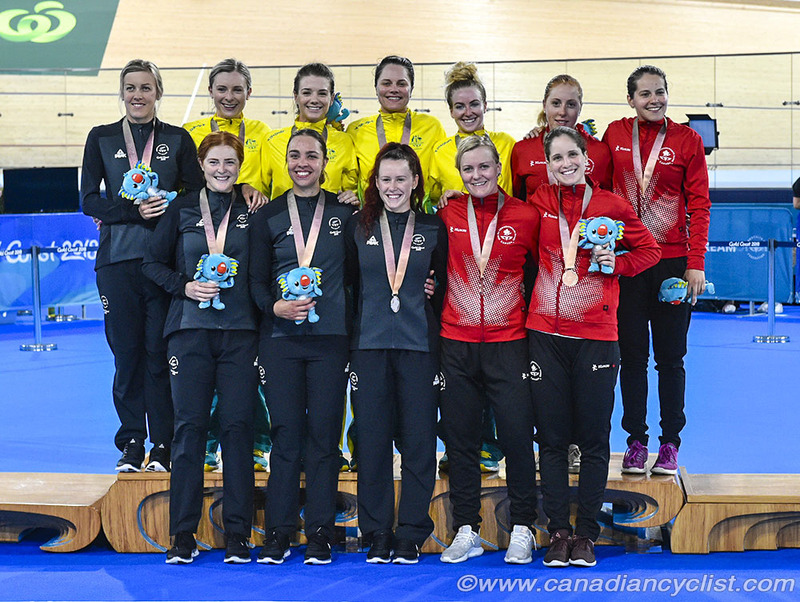 Canada opened the cycling events at the Gold Coast Games on Thursday with bronze medals in the Team Pursuit for both men and women at the Anna Meares velodrome in Brisbane. 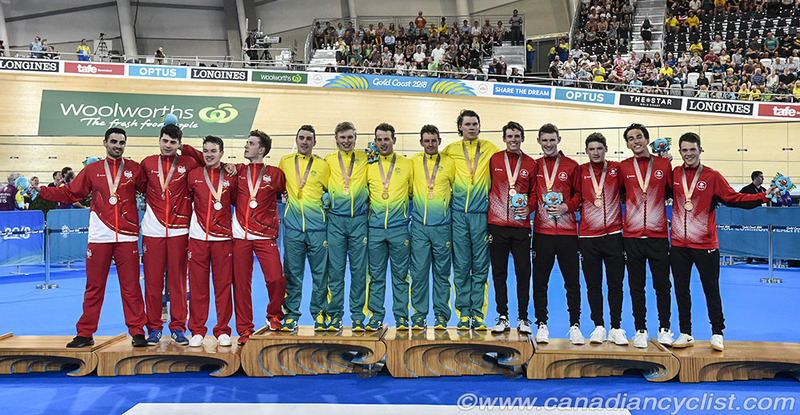 The Team Sprint competitions were also held, with the Canadian men finishing fourth. "Track racing at the Commonwealth Games is always super competitive because most of the best nations are here," said Cycling Manager Kris Westwood. "So to finish the first day of competition with two medals is a great weight off our shoulders. It's particularly satisfying because this is a young team without much Games experience - only two of these riders competed at the Rio Olympics. These results are a testament to a lot of hard work, not just from the athletes but also from a whole bunch of people far from the spotlight." 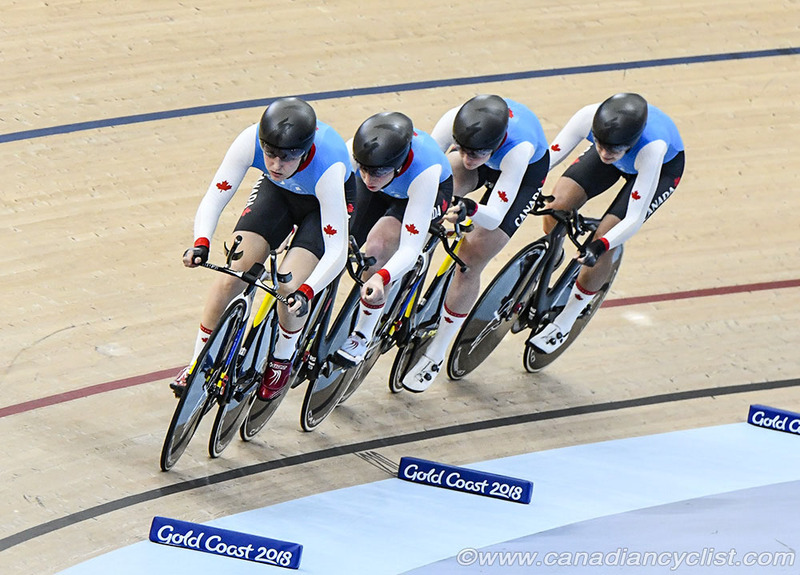 The women's Team Pursuit is a new event for the Commonwealth Games, and Canada came in as a definite medal contender after multiple World Cup and world championship medals, plus bronze at the last two Olympic Games. The team of Allison Beveridge, Ariane Bonhomme, Annie Foreman-Mackey and Steph Roorda were disappointed to miss qualifying for the gold medal final by 0.153 seconds, but regrouped to take the bronze medal against England, with a time of 4:21.493 . Host Australia won the gold medal after catching New Zealand and setting a new Games record. "We were definitely more satisfied with our second ride," said Roorda. "The goal was to win the bronze medal, and we reassessed and improved on some stuff from the first ride, which was positive. It's pretty great to get the first cycling medal; it's awesome." "We came here to get a medal - maybe not that colour - but it's really good to come out with one," said Bonhomme. "I think with nerves and being on a new track, we weren't as steady in our first ride. We calmed our nerves and went back to basics, and we knew what we were capable of, so we delivered." "Coming into these Games was a different feel," said Foreman-Mackey, "and to come here with that experience of being in Rio helped prepare me for what a major Games can feel like. So I feel I came here a lot better prepared and ready to race. I think we've got a lot more in us, we were disappointed after our qualification ride, so we tried to clean it up for the Final. But we still have room to improve. With only two rides, you really to lay down a solid qualification ride, and we didn't quite do that. Obviously, we wanted a different colour medal, but we can't be too disappointed coming away with a medal." 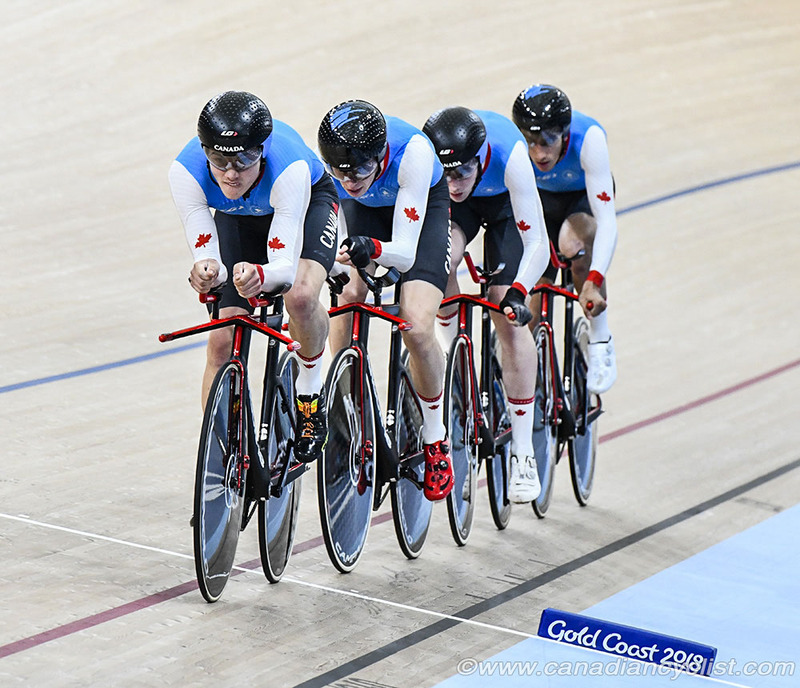 Canada came into the men's Team Pursuit having finished fourth at the 2014 Games in Glasgow, and were looking to improve. The team of Michael Foley, Derek Gee, Adam Jamieson and Jay Lamoureux originally qualified fourth, but moved up to third after New Zealand was disqualified for having non-regulation equipment. In the bronze medal race against Wales, the Canadian team replaced Jamieson with Aidan Caves, and recorded a time of 4:00.440 . Australia took the gold medal in a world record time, defeating England. "One spot better than four years ago and 13 seconds faster, so everyone's really excited about that," said Gee. "It's just unreal to be a medalist at the Commonwealth Games." Caves, the only rider returning from the 2014 team, said "It feels amazing. We got pretty lucky that the Kiwis had an unfortunate disqualification. In the final, we basically just rode our first schedule but a little faster. Third feels amazing; to come back four years later with a new group of guys is incredible." "This is unreal," said Lamoureux, "I never would have expected this and I'm just over the moon right now. And also in a lot of pain! In the second ride we brought in Aidan, replacing for Adam [Jamieson], and I rode in Adam's position, in third spot. We knew Aidan was going really well, so we wanted to give him a shot at it." In the women's Team Sprint, the Canadian duo of Amelia Walsh and Lauriane Genest recorded the fourth fastest time, but were subsequently disqualified for exchanging outside of the regulated zone, and did not advance to the medal round. Australia won the gold medal ahead of New Zealand. "I kind of knew when Lauriane came past me that we would probably get relegated," admitted Walsh. "I'm very impressed with our time, regardless of the relegation and it's very encouraging for the future. I'm really looking forward to training and competing more with Lauriane." 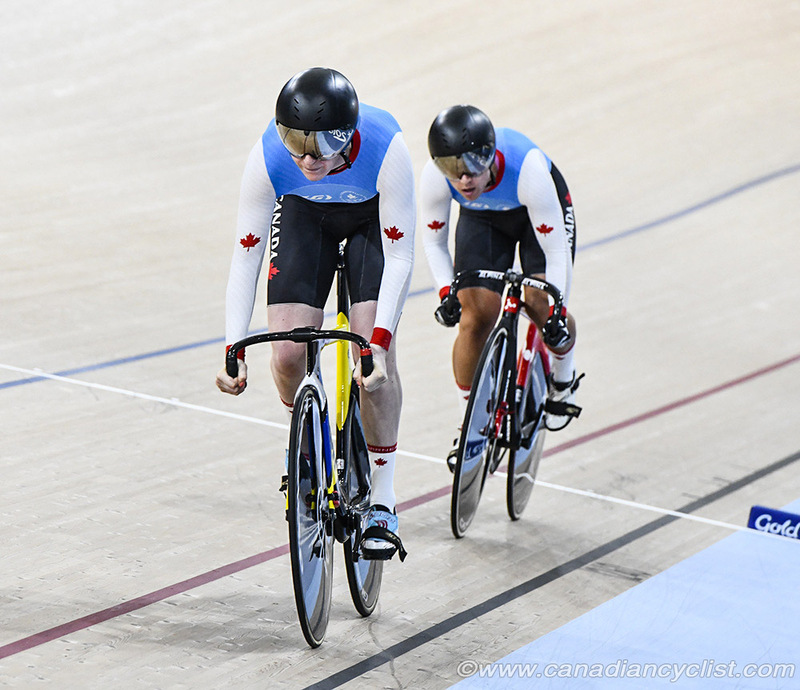 "I wouldn't say that we've been training for Team Sprint together; this is our first race together and we did one trial run together before we left Canada. I wouldn't say that was the only reason [for the mistake], but it was a factor." "It was quite cool walking into the stadium and seeing the stands full. We've got three more days of racing, so we have to put this behind us and move on." "Yes, this is my first big Games and I'm pretty impressed," said Genest. "When we first walked into the velodrome with all the people, I though 'okay, that's a big deal'. I realized it was big at that moment." "Technically, our exchange wasn't done properly, and that's my fault. When the race starts, I don't really think and that's something I have to work on, because I didn't even think about that happening. But I'm really impressed with the time because it is the best time we have done." 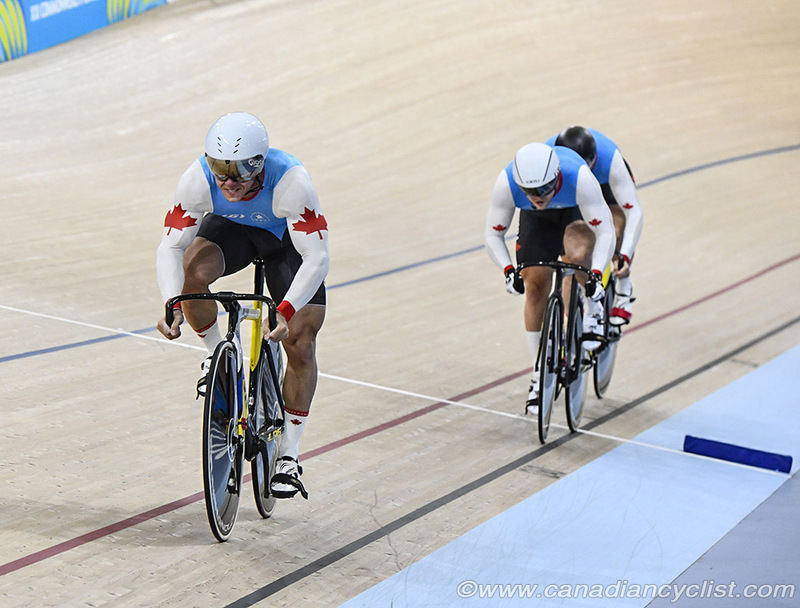 The schedule concluded with the men's Team Sprint, where the Canada squad of Hugo Barrette, Stefan Ritter and Patrice St-Louis Pivin qualified for the bronze medal final. The team lost to Australia in the medal race, to finish fourth. New Zealand beat England for the gold medal. "It is awesome to be here; the crowd is awesome," said St-Louis Pivin. "We did a PB [Personal Best] for the team, so we are just looking forward." "For the second ride we made a choice to go up a gear and unfortunately it didn't pan out the way we hoped it would," expalined Ritter. "We know it doesn't work now, and that the gear I used in Round 1 was a solid ride. This is a whole new ballgame, like Patrice said, the crowd is absolutely brilliant, and just to perform at this level, on this stage, is an honour." "The first ride was pretty decent and for the second we tried something a bit different," said Barrette. "It didn't turn out the way we wanted, but we are heading the right direction. Within the next year I think we will try to be competitive internationally. We are really a new team."